Freaks operate at night. In Nightcrawler. Lou Bloom (Jake Gyllenhaal) is a middle aged individual living in the city of angels, Los Angeles, looking for a job. Lou is…a little odd to say the least, but the drive he possesses is evident. Still, a regular 9-to-5 doesn’t appear to be a match for this man. It isn’t until Bloom drives by and makes a stop at the scene of a graphic car crash when the proverbial light bulb goes off in his head—capturing raw (pun intended) crime footage is the job for him. After asking for a position and being declined for it by well known “nightcrawler” Joe Loder (Bill Paxton), Bloom decides to do it himself. Hiring an assistant, he goes wherever the story and crime scene take him. Operating under the mantra of “If it bleeds, it leads,” Lou makes it his mission to seize the most visceral content on recording, even if it means blurring the line between passive recorder and active role-player within it. 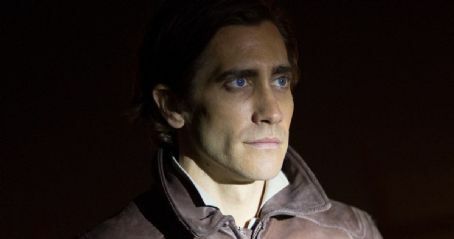 From beginning to end, Nightcrawler makes its home in darkness, both literally in its structure around key events taking place at night, and figuratively in its analysis of its characters into a black abyss. Really stated the obvious there, but it is a fact. It is quite original, never predictable, and one of the more intense films of the year, if not the most. The movie is a look at the news, and what makes its way on it. It is one thing to catch the big story and footage and to be first on the scoop. What is done with that story is up to the producers in the studio. Some key concepts here are the ideas of framing and leverage. The former pertains to really how something is shot. Simply, much like directing a movie, capturing something or lingering on something in a specific way as opposed to another way will create a specific desired effect on the viewer. Add in some charged language, and you have sensationalism at its peak. Watching Lou Bloom get the perfect shot on his handheld camera using knowledge of what works almost serves as a meta-ish take on directing, since we are watching first time director Dan Gilroy use much of what Bloom is harping on here. It is a wonderfully framed movie, with more tension than some horrors, whether in a production room or at a crime scene. To those in power or aspiring to be in Nightcrawler, people are looked at as objects, expendable pawns as a means to a potentially rich end. Whoever has the leverage holds the cards to getting what he or she wants. Disturbing as it may be especially as I thought about this in real life terms, it is very fascinating to witness. Jake Gyllenhaal is Lou Bloom. He is not someone playing Lou Bloom, he wholly disappears into Lou Bloom. His 20 pounds lost have a very small part in this, but Gyllenhaal at this point is just a tremendous actor with a keen eye (and/or perhaps a great agent) for realizing what is a good script and a character someone of his talents can sink their teeth into. About the only minor grievance, and it is not an issue with Gyllenhaal, is that I personally would have loved to get even more background about how Lou came to be. Still, the delivery he brings, the self-affirmation his character possesses, and the occasional dark humor found in a really despicable character all in all make for one of the best characters of the year, and easily a top-notch performance. It is the little things Jake does; it is not just what his character says, but how he raises his voice or sits in a chair when driving home a point. Even when Lou doesn’t have anything to say, his expressions tell a thousand words. It may be premature to say especially with still a few award-aiming movies yet to be see on my end, but Gyllenhaal should probably be in the running for some big awards come 2015. 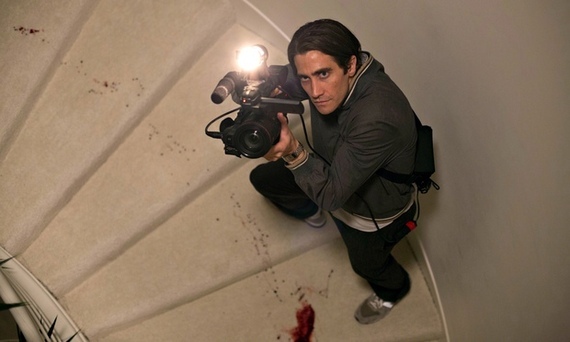 Gyllenhaal’s character is definitely the focal point, but in this grimy business, he isn’t alone. Aside from Thor, Rene Russo hasn’t done anything of note. Literally, nothing besides Thor can be found in her filmography since 2005, and it isn’t like her role is sizable in those films. Here, she has a lot to do and comes through in spades. Her character’s “survival” is dependent on Lou Bloom, and as a result she is tied to his hip. There are many scenes between the two that show the very dark professional relationship, and it becomes uncomfortable to witness. Yet, it is all handled with subtlety. We know what is going on, but do not need to be shown it. It makes it that much more to think about, because the characters themselves are so mentally off. Other performances of note include Bill Paxton and Riz Ahmed, both serving key roles to move the story along. With this being Dan Gilroy’s directorial debut, it is an achievement at how complete it comes together, from production to cinematography. It is somewhat of a slow build that may be an issue to some, but here the pace felt logical and sensible. There is a little disappointment with the score. It may require another listen and watch but nothing really attracted the ear on first view. With a standout score this could be in a league of its own. 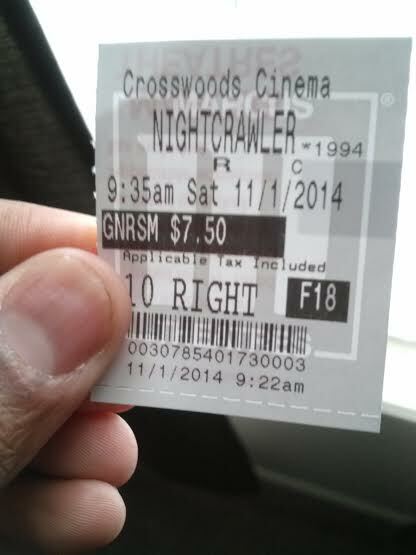 Unequivocally however, Nightcrawler is still in a very high league of films as it is. Can it crawl itself to a few major film nominations? Remains to be seen, but this should be seen, regardless. Photo credits go to huffingtonpost.com, shockya.com, and m.famous.com. Excellent review. Looking forward to seeing this next week, especially to see Jake Gyllenhaal’s performance. I think he’s one of the most underrated actors out there. Thanks for the comment Polarbears! I feel like you and I have a somewhat similar taste in cinema, I highly believe you will love this. So looking forward to seeing this. Your positive remarks make it more anticipatory! I really believe you’ll enjoy! Love to see your take on this! One of the better films I’ve seen all year. Finally saw this. Oh man, Jake Gyllenhaal was fantastic. That dinner scene in particular was chilling, and those last 20 minutes were incredibly tense. Also, it looked gorgeous all around. Looking forward to checking out your review!